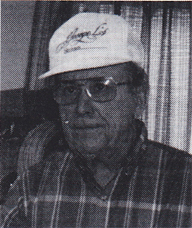 George L. Lewis, Sergeant, born in December 1921, Bible Grove, IL, graduated high school and spent two years at Milliken University. He joined the USMC on March 4, 1941; attended boot camp and Sea School at San Diego, CA; then sent to Marine Det. in the USS West Virginia (BB-48) and was aboard Dec. 7, 1941. They fired several shells before the USS Arizona blew aft of their ship and fire was everywhere. They swam to Ford Island ahead of the fire on the water. After two weeks on Ford Island his unit was sent to Maui to guard the Navy airfield there; two months later, went back to Pearl Harbor and helped raise the West Virginia. Mustered and stood by during the Battle of Midway; sent to Salt Flats and trained with the 2nd Raider Bn. ; transferred to the 3rd Def. Bn. ; and was shipped out with the 1st Mar. Div. to Guadalcanal, landing Aug. 7, 1942. He spent six months and 12 days on the Canal, then was sent to New Zealand to pick up replacements and train them. They shipped out with the 3rd Mar. Div. and landed on D-Day, Nov. 1, 1943, at the Island of Bouganville. Memorable experiences include Hawaii before the war; Pearl Harbor bombing; Guadalcanal; and Bougainville. Discharged in November 1946 with the rank of sergeant. He received five campaign ribbons, six Battle Stars and the Bronze Star on two different occasions. Married and has two daughters and two grandsons. Worked nine years as a plant manager and 25 years in his own business of manufacturing and distributing his own line of musical products called George L's with the help of his family. He enjoys hunting quail and pheasant. He is a member of the 1st Mar. Div., 3rd Mar. Div., Pearl Harbor Survivors and 3rd Def. Bn. Organization.